I purchased this frame in order to frame a Marine flag. The flag looks good. It did, however, take 3 people to complete the process. It was definitely packaged well. I do believe that it was still over-priced buying direct. No complaints about the representative that initially handled my call. She was professional and helpful. I used to work in a frame shop so I know frames. I have put together hundreds of metal frames just like this one. This metal frame was harder to put together than I am used to. The corners just didn't tighten up nice and square like they should. I struggled to get them lined up right. It will do, but I don't think I'd order another metal frame. All the parts were there and then some. I have ordered wood frames from this site and they were great. Very well made. All the prices are pretty good too. Hello Elizabeth! Thank you so much for your helpful review. We regret that you had difficulty assembling the frame. We understand you have assembled many frames and this should also be an easy task. Most of our metal frames are sent unassembled expect our Back Loader collection. If your frame is not completely aligned properly, we are happy to give you some guidance over the phone. We are happy to send you a different set of hardware since the screw would not tighten. If we can discuss this more over the phone, that will help us determine how we can resolve this issue. I will reach out to you by phone today. In the meantime if you need further assistance, please give us a call at 1-800-332-8884. Thank you again for being a loyal customer! metal frames--always fit well, packed with all the necessary hardware to assemble....easy and quick, makes a nice finished modern look. I needed a custom frame for a canvas print and didn't want to spend a lot of money. This frame fit the bill. Fairly easy to assemble and it fit my artwork perfectly. Quality met expectations. Value exceeds expectations. Order processes and website user experiences exceed expectations. The frame is fine, shipping was great. Had to get pliers out to bend the interior channel. Could not get the hardware to slide in place due to the channel being bent in cutting. At least nothing shows on the outside of the frame. I bumped up my order to qualify for free shipping on my order. Have not created the piece yet, but I know this frame is quality, I recommend it for easy assembly economy and versatility. Accommodates canvas, paper, illustration board even wood substrates. GREAT VALUE! GET IT!!! I'd highly recommend these frames to anyone as they are sturdy and well built (quality seems very high), fit together nicely, and are easy to assemble. Inexpensive as well. I specifically use them to frame my 18" x 24" flat panel canvas paintings, and when using the 1.375 inch deep frames of the NCMBLK type, they take on the appearance of my having used stretched canvas instead of flat panels. They also can be spray painted to take on any color. If you do spray paint them, better to use flat paint as it does not streak like gloss or semi-gloss. It's simple and straight to the point. 1. The price is fantastic. 2. The metal quality of the frame is fantastic. 3. Puts more emphasis on the picture itself, not the frame. 4. The best part of this is that I dare say with this frame my pictures will outlive myself. The frames are gorgeous! Such a large selection. I am very, very pleased with my black metal frame. I will certainly order my frames from you! Hello Daniel. Thank you so much for your feedback. We regret you had a slight issue getting the frames to assemble with a nice square corner. If the frame is not up to your standards , we are happy to exchange the frame. Just let us know if you would like to return the frame and we will email you a return label. We do offer Metal frames that are pre-assembled just in case you want to save the time of assembling the frames. Please let us know if you need further assistance. Thanks again for your business. Happy Framing! I have purchased these before and had no issues. The second purchase was a disappointment. I bought two sets of large frames and one is not straight at all. It would have cost me more is pack and ship it back. Whoever cut them did not inspect the material. Hello Jan. Thank you letting us know about the frames not being in satisfactory condition. We sincerely apologize for that. We reached to you by phone, and left you a voicemail. We are happy to offer you a replacement or refund. We will provide a return label if you decide to return the frames. Of course we do not expect you to be responsible for the expense of returning the order. We regret this has happened with the order. Could you please email picture of the frame to customercare@pictureframes.com. The photos will help us improve our quality control. Also, our production supervisors will be made aware of the miters not lining up properly. We certainly will make any necessary adjustments need to our machinery. Please let us know which option is best for you to resolve this issue. Please call us at 1-800-332-8884. We look forward to hearing back from you. Happy Framing! I would recommend the product from the frame point of view, but the wire sent with the size frame I ordered wouldn't go across the frame, it was too short. The hanging loops for the wire installed easily, but there were sharp edges on the insides of the hanger hole which caused the wire to be cut as soon as you hung the framed piece. So the standard parts package that you send out, doesn't compare to the nice frame. I am disappointed in the packages I received. When I placed the order I ordered frames with a height and width measurements as a whole frame, and was charged accordingly . What I received where several groups of cut metal frame parts but nothing as one whole frame parts. In orther words "here is your various cut...you figure them out" After I spent several hours trying to figure out what was what, I noticed one frame was completely overlooked and missing. I don't believe this was a particularly difficult or hard order to complete but someone goofed up. I am disappointed in the lack of attention to detail, and professionalism. If I order one frame I expect to receive all the four sides. If I order several frames I expect to receive all four sides banded or taped together as one frame, for each of the frames not a mishmash. Hello David. Thank you for your feedback. We really appreciate you bringing this to our attention. Your comments have been forwarded to our Operations Team. I am optimistic that we can find a way to package your order in the way that is pleasing to you. Please give us a call when you have framing needs so that we may make a request for special packaging for your order. Also, please let us know the frame size you are missing, and I will send you a replacement order. I left you a voicemail regarding this matter also.If you have any further questions, please contact me directly at 1-800-332-8884. We apologize for any inconvenience. Happy Framing! Because it’s been over a month since I ordered my single picture frame and I still haven’t received it. Shipping has been a nightmare. I’m not sure I’ll ever receive this frame. Hello Vanessa. We regret to hear that the order has not arrived. We have been in contact with UPS regarding the order and they have confirmed the order was delivered. I attempted to reach you by phone today and left a voicemail. Please give me a call directly and confirm that the order has been received. I can be reached at 1-800-332-8884. We will find a viable solution as soon as we speak with you. Have a great day. My customer and I chose this one because it was perfect for her canvas! A perfect frame for my own work - reasonable price, great - prompt service - nice product! these frames look great for matted photo prints. This frame type works great with stretched canvases that are 3/4 inch in thickness. The frame adds real dimension to the piece. Needed good plain frame for acrylic painting purchased by our Principal for hanging student artwork in school. Purchase these frames before for the canvas prints. Frames are strong and fit my needs. Like a simple metal frame that doesn't overwhelm the artwork inside! Will work as a shadowbox for artwork. I wanted a metal frame that was cheap, simple and nice looking. I also wanted it to come in a small box. I wanted a thin, black edge along my canvas. I also liked the fact that you labeled it as a frame that would fit a regular canvas. I have bought these matte metal frames before for my narrower sided canvases. They look classy and they are very good value. They are straight forward to assemble too. 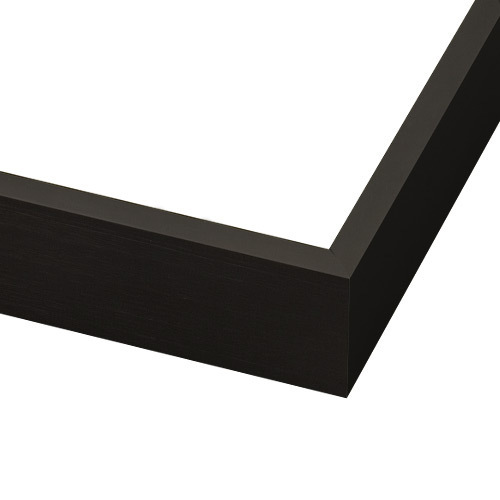 Modern, low profile frame from a dependable supplier. We’ve ordered before and will order again. Framing a large linen print. It made my image pop. And I think it was on sale. A substantial thickness for rigidity when we use a real glass insert. I've used this style frame in the past for canvas prints. It works perfectly and looks great, giving the image a finished look. I love this simple metal frame for paintings. Have ordered it numerous times, and will continue to do so. To match another frame already in place. Best for stretched Canvas print with minimal coverage on the print. Simple clean lines, I have several of these in my house on art, love them! I have used this moulding many times...The quality is good, easy to assemble, reasonably priced...and arrives very quickly ! I like the thin boarder it gives my oil paintings on 3/4" canvas. BEST ANSWER: Hello Traci. We’re sorry to hear your order arrived without some of the items you were expecting. Unless otherwise noted on our site or catalog, our frames don’t automatically include acrylic glazing and foam core backing kits. We don’t sell glass for frames, we sell picture-frame quality acrylic which is plexiglass. Glazing and backing kits are not included automatically because not all artwork or customers need them for framing. Canvas paintings, for example, would be damaged by glazing of any kind. These are offered as separate add-on items during the ordering process which can be added after a frame size is selected. If you require glazing and backing kits to complete frames, you can order acrylic and foam core backing on our website in the Frame Shop, or by placing a phone order with any of our Advisors, any time from 8 pm – 7 pm EST Monday thru Friday. We can be reached at 1-800-332-8884. Happy Framing. Do you carry spacers to frame a print that needs to float without a mat? BEST ANSWER: Hello! Thank you for considering us for your framing needs. The spacers we offer are used to lift the acrylic away from the artwork. We have the spacers in two sizes and colors;1/8" and 1/4" in clear or black. We apologize that the spacers are not available to be purchased online. If you could please give us a call at 1-800-332-8884, we can further assist you over the phone. Thank you again for reaching out to us. Happy Framing! Can I get a wood frame ? How would that look.